As I explained in my previous blog , the default settings came with DD-WRT v24 micro version seemed unstable for the wireless connection. At first I tried to revert to the original Linksys firmware, but after I found out there was no way to go back, I tried various settings to test. Now I believe that I have a fairly stable connection that I never experienced connection drop after I tuned the settings. I would like to share my settings with you so you can enjoy the DD-WRT. The basic purpose of my tuning was to have a stable connection, not to have fancy functions. So I tried to disable all the functions that I found not necessary. 1. Rebooting the router daily automatically using Schedule Reboot. Somewhere on the DD-WRT site that someone is using this feature to reboot the router daily. I am not sure if this really helps to stabilize the overall router operation, but I think this could be a good way of maintaining fresh router state everyday resetting critical system resources such as memory. Wireless Network:If you use G only , select ‘G-Only’. Wireless Channel:You should select the one that used the least throughout the nearby routers within your area. Wireless SSID Broadcast:There is no reason to enable this. You don’t want others to see your SSID anyway. Sensitivity Range (ACK Timing) : The default value was 2000, but changed to 200. According to a forum entry, someone suggested to use the double value of the distance between your router and client. But I didn’t find any actual improvement on the wireless signal or connection status. 3. 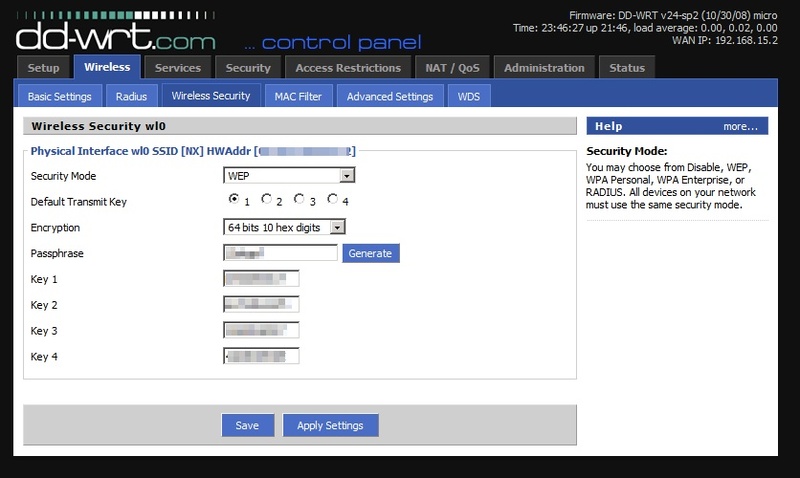 Wireless Security: Using WEP instead of WPA. It appears that I would have unstable connection or slower speed with WPA. Perhaps, the problem is with my wireless client , but with WEP, everything was OK. So I decided to live with WEP and disabling SSID broadcasting. But beware if you are serious about the security, you should not use WEP at all. Okay, now I will go over with the detail settings. This was the most important place to obtain the stable wireless connection. CTS Protection Mode: This is something that is good when to use b and g togather. If you use g only, change this to Disable. TX Power: Now this is one of the popular topic in the DD-WRT forum. This is related to transmission power and if you set this value too high, then the router may get burnt or won’t last its intended life span. The recommended max value is 70 which is the default. But please note that many users have said that increasing TX power does not boost the wireless signal that much. In fact, I did not see much difference either. So I decided to use the default. 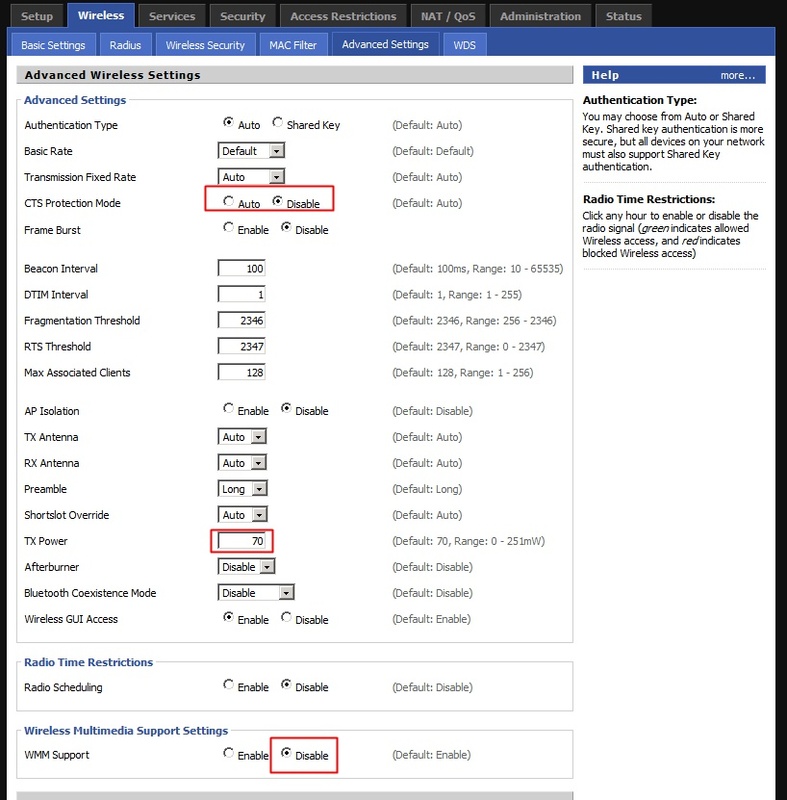 Wireless Multimedia Support Settings: This is something to do with QoS of multi-media. I’ve lived a great life with my previous router which didn’t have such functions so I decided to turn off the option. It was enabled by default. Buy.com's Deal of the Day! | Amazon.com's Today Deal | Abe's of Maine's Deal of The Day! So, now I am very satisfied and having a good time surfing Internet without the connection dropping. I think the important options for the stable connection were “Disabling CTS Protection Mode and WMM Support” in Wireless Advanced Settings menu. So if you experience the same problem, you should consider to change these options first. My 5 years old Netgear (WGR614v2) router started dropping wireless connections which made me really annoyed. So I finally decided to buy a new wireless router. It was a very difficult decision to decided which wireless router, but since I wanted to try the DD-WRT firmware and it was most likely supported in Linksys router series , I started searching WRT54G models. But then there were several WRT54G series which made me confusing. After spending some time to compare models I bought WRT54G2. It appears that WRT54GL is the most compatible router with DD-WRT, but I chose the G2 because I thought it was the most recent version of the WRT54G series and comes with the best quality which was an incorrect assumption. But most of all, G2 was cheaper than GL about 10 bucks around 45 bucks. Ok, so I tested the wireless connection out of the box without DD-WRT, and it was working nice, not dropping any connection even if I visited graphic intensive websites. And then I performed the DD-WRT firmware setup for WRT54G2 using this URL – Linksys WRT54G2 Flash Instructions from DD-WRT.COM website. Please note that only DD-WRT micro version is supported for WRT54G2. Also there is no way to revert it back to the original Linksys firmware as of this writing. If you are considering to purchase Linksys wireless router to try DD-WRT, make sure you buy better routers such as WRT54GL which supports full DD-WRT version. For the complete supported device list , check out HERE. Luckily, it appeared that I successfully updated the firmware that I was able to login to admin website by connecting http://192.168.1.1 . The default ID is blank and Password is ‘admin’. Everything looked very nice, even though it was micro version, there are more options than I needed. What I really liked about the firmware were the wireless client connection status and graphical bandwidth usage page. It provides detailed information about the current status of the routing that I really loved it. However, it seemed that the wireless connecting quality was degraded compared to the original Linksys firmware. Connection became unstable and slower than before. I tried everything googling everywhere but the quality did not improved as I hoped. Now I wanted to go back to original Linksys firmware, but I found out that there was no way to go back as of now. There was only one way. To wait until the developers come out with the solution to revert back to the original state. I was terrified and felt really bad of myself installing DD-WRT without checking out more carefully. I searched all the website intensibly for the solution to stabilize my wireless connection and tried every possible wireless options. And finally I have the wireless connection stabilized and now I am so relieved that I didn’t waste my money. I will show my DD-WRT settings in the next blog entry. Thank you for reading my blog and enjoy! Here are the setup procedure and other resource links related to DD-WRT. Please make sure you read them all thoroughly before installing DD-WRT. Here is my next blog article on the tuning the settings.